France in London | Etes-vous accroc au bio? Have you succumbed to the organic mania? For a few years, more and more people eat organic, drink organic, make up organic, and even dress organic. France is currently succumbing and nobody could ignore it: organic is everywhere from supermarkets to covers of magazines, from beauty shops to restaurants. More especially it’s been weeks that organic are making the headlines and the mythical “Salon de l’Agriculture” is currently making a large place for organic farming. The credo is “Farming generation, product today, feed tomorrow and respect, always.” Why this new passion? Yet, French people have been resisting for a while, as they always do. This old rural country doesn’t make rhyme gastronomy with fancy. Food is quite a sacred thing (or should I say one more sacred thing in France?) for these “bon vivants”. So, even if politics recognise organic food early (1980) and if French organic label AB was one of the first one in the world to be created (1985), French people remained suspicious. British people are in a different situation. Organic is not a new fancy at all, the Brits had converted a long time ago. Actually, they kind of invented it. British Sir Albert Howard wrote “ An Agricultural Testament” in 1940 and was one of those who paved the way for organic farming. Then, Brits fed up with junk food fell in love with organic food. From one excess to another, there’s only one step in the UK. And marketing helps them to step in organic world. Never underestimate the power of advertising in the UK. So, one of the first organic shop which opened in London was called “Fresh and Wild”. Such a good name! How could English people not feel concerned? 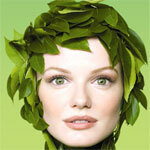 Organic products began immediately fashionable and British people turned out to be organic freaks. Not to mention the effects of the food problems during the 90’s and the obsessive fear of mad-cow disease. They simply urged to be sure of what they have in their plates. In 2006, they spent £2 billion in organic food. However, the credit crunch makes them slow down their organic consumption. Every little helps. But, more generally, why does organic attract? Organic addicts invoke first the health. Organic foods are made according to certain production standards, meaning they are grown without the use of conventional pesticides and artificial fertilizers, free from contamination by human or industrial waste, and processed without irradiation or food additives. If livestock are involved, they must be reared without the routine use of antibiotics and without the use of growth hormones, and generally fed a healthy diet. 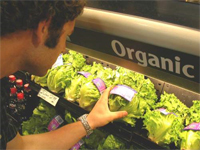 Organic produce are not be genetically modified. So it’s obviously healthier than junk or processed food. Besides, eating organic is less fat in general and people eating this type of food are more keen on fresh fruits and vegetables. No worries for their five fresh fruits and vegetables a day! Most of the times, these people are sugar conscious, caffeine conscious, and keep on pleading for low sodium… such a model of healthy diet! It is generally a part of an healthy way of life including sports and Zen attitude. Don’t dare to tell one of them he looks in bad shape and should wonder if he is not wheat allergic. You are going to scare him to death! The eco-friendly aspect is extremely important as well. 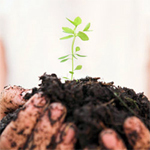 Organic farming could be linked to sustainable development since it doesn’t imply fertilizers or chemical products so it doesn’t pollute soils and ground waters. Besides, this type of farming is based on proximity and on season products. Therefore, it reduces the pollution due to importation and has a more human dimension. Eventually, eating organic is reassuring since one knows what one eats… which is not the case with processed food! That’s why organic products are under a meticulous surveillance and need to be labelled. If it’s so good, why don’t anybody eat organic? The main reason is, without any doubt, the cost. Organic products are more expensive than non organic ones. So, we have to admit that eating organic is socially connoted. That’s why it concerns only 1% of the world’s food market, 49% of it in Europe and 47% in North America. Besides people don’t have the organic reflex yet and it’s harder to find than non organic ones. The day when everybody will eat organic is not about to come despite of its general good image! Too bad! Whats best for the planet, some nice conventional veg from the farm next door or organic flown in from california???? ?